Hold out your thumb and point it upward as if giving the thumbs up sign. Check the angle of the thumb. Is it standing straight or does it curve? This says something about your personality. Some people have a straight thumb when they give a thumbs up. There’s no bend to the bones at all, and the thumb doesn’t even slightly retract backwards over the knuckle. 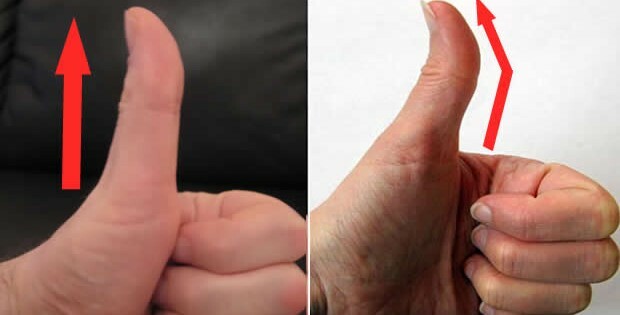 The straight thumb could mean that you’re a more serious person than most. Though you don’t show your excitability, it doesn’t mean you’re a downer. Then, we’ve got the crooked thumb. As you can see, the back of it curves. It can curve a lot or a little, depending on the person. A crooked thumb mean you are so much expressive you want to express your feelings with all and put yours thought out. A person whose thumb makes an obtuse angle with the index finger is a gem. Such thumbs are well-built, long and lean. They are called tender thumbs. 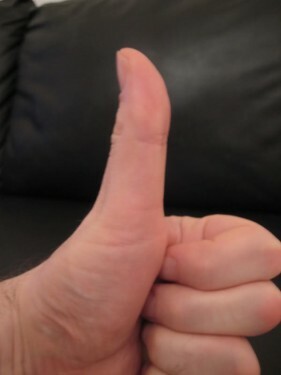 People who have such thumbs are calm and thoughtful. They usually make great artists and musicians. 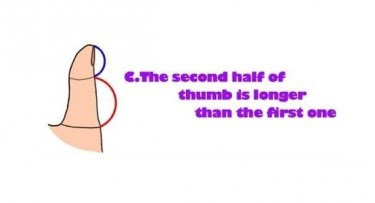 Unlike the fingers, your thumb is divided into parts. Now if your first half/upper phalange (biological term for bones of the fingers and thumbs) is longer than the second phalange, then you are driven by a strong sense of will power. Check your thumb, because this means that you are a hard-working person with an iron will! In matters of love, you are 100% dedicated, and you are extremely faithfull. 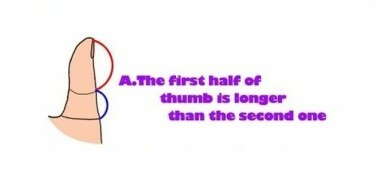 If the second half is longer than the first one, then you make all your decisions based on logic, instead of will power. You tend to restrain yourself when it comes to falling and feeling in love, and as a result you may miss out on dome golden opportunities to find a suitable life partner. Try overcoming this issue, if you want to find love, just listen to your and let logic a back-seat for once. So which type do you have? 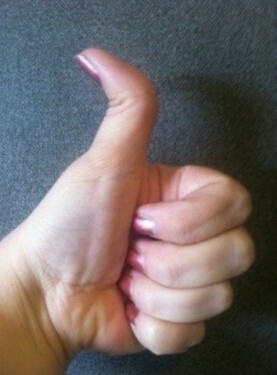 Are you the seriously straight-thumbed type, or the animated, curved, life of the thumb party?